So mainstream media coverage consists almost entirely of the following “master narrative”: Texas spends too little on child welfare, the only mistake Texas child welfare makes is to leave children in dangerous homes, Texas should take away more children and anyone who thinks otherwise must be one of those right-wing spare-the-rod-spoil-the-child “parents rights” fanatics. One of those themes actually is correct: Texas should spend more. The rest is Texas-sized misrepresentation. It misrepresents not only those of us on the Left, but also many smart, principled conservatives with whom I disagree on almost everything but who care passionately about protecting children and see that the current approach isn’t doing the job. Speaking only for myself, I’m a lifelong tax-and-spend liberal who proudly cast his first vote in a Presidential election for George McGovern and his last vote in a Presidential primary for Bernie Sanders. And one look at the Board of NCCPR (go ahead, have a look) makes clear we’re not exactly a right-wing bunch. But that stereotype also may explain some interesting findings about racial disproportionality in Texas child welfare, discussed in an excellent story that, itself, breaks the mold for Texas media. The story, by Julie Chang of the Austin American-Statesman, reports that statewide, African American children are, proportionately, twice as likely to be torn from their families as white children. But in the liberal bastion of metropolitan Austin, Travis County, they are eight times more likely to be taken away. Statewide, Latino children were less likely to be removed than white children, but in Travis County they were three times more likely to be removed. Indeed, that progressive tradition actually might contribute to the problem. Because many on the Left have a blind spot when it comes to child welfare, they are not as vigilant And because they see an intervention by Child Protective Services as benevolent, they are less sensitive to both racial and class bias, and more likely to needlessly call a child abuse hotline and trigger a child abuse investigation. Of course, all that winds up hurting the very children my fellow liberals want to help. 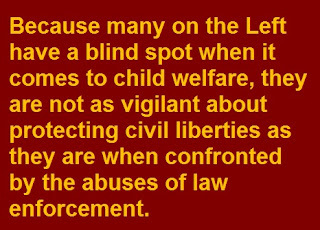 about protecting civil liberties as they are when confronted by the abuses of law enforcement. Financial pressure in part caused by the rising cost of living, limited community resources such as affordable housing, and institutional racism drive the differences in Travis County, which have widened over the last decade, according to child welfare advocates. Two Texas studies conducted in 2008 and 2011 found that even though African-American children were considered at lower risks of maltreatment than white children, CPS workers were more likely to remove an African-American child from the home. This of course jibes with a wealth of other research that the denial caucus chooses to ignore. Advocates fear that the disparities will worsen with the loss of the state’s Office of Minority Health Statistics and Engagement, which had shared data with the child welfare agency but was shuttered Sept. 1 after the Republican-led Legislature cut funding. But this also illustrates another point: Texas doesn’t just need to spend more, it needs to spend smarter, on everything from tracking racial bias in child welfare to actually doing something about it. We have to admit that this child welfare system was not created for African-American children. We did not have African-American children in mind when we started looking at a state agency that would intervene in a parent’s right to be a parent. We were looking mostly at Anglo children and how we could support their families. This system needs reform. The rest of the media in Texas should pay attention.